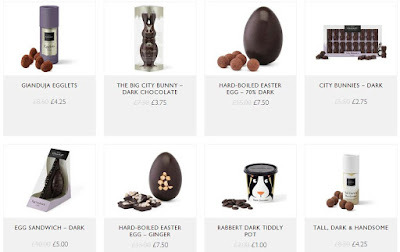 The Vegan Magpie: Hotel Chocolat sale! Hello! As with most places that sell eggs, Hotel Chocolat is having an 'end of season' sale. Included in this is their vegan range! Yaaay cheaper chocolate! Just go here: https://goo.gl/3IVDM6 This should have already applied the vegan filter. I can't find an end for this sale, I assume it would be until they sell out, which I expect will be soon! However they do have some vegan items left as I'm posting this. There is postage so don't forget to factor this into your price, or it may be worth going to one of their shops if you can! As always, please check you're happy with the price you're paying. Hope this helps (and no one is disappointed if they sell out quickly)! I would love to see pics if anyone buys anything from this via Twitter or comment below!